Large Bore Four-Way Valve Tool Haltec TL-695 / BOWES HT TL-695. The TL-695 is a four-way tool that repairs the internal and external threads on air-liquid valve spuds. 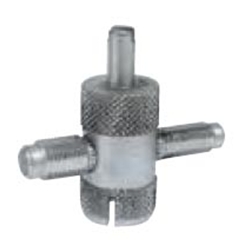 It also is a Large Bore valve core insertion tool, and it repairs internal and external threads.